Updates on what has been happening in the past week and upcoming events. Why not purchase gifts from our shop for your loved ones this Eid, we have special offers available on selected items drop by if you are in the area. Eid offers include 20% discount on books use the code “EID 20”. We have new items in stock, look at the Shop section for more information. IHRC is is holding the Decolonising the Mind course led by Sandew Hira from the International Institute for Scientific Research in the Netherlands. For the London course you have the option of choosing either the 19th or 20th October 2013 9am-5pm book your tickets now, more information below. IHRC urging government to repeal Schedule 7 of the Terrorism Act. The Islamic Human Rights Commission (IHRC) is urging the government to repeal Schedule 7 of the Terrorism Act when MPs debate making changes to it on Monday 14 October. Rabbi Yosef attracting controversy by referring to Palestinians as snakes. Help the Holy Land 5 detainees by campaigning for their release. London (One Day Course) – Saturday 19th October or Sunday 20th September 2013 9am-5pm. Book your ticket now. Following the successful distribution of Eid packs to 600 prisoners for the last two years (see below), IHRC is organising to send more packs for Eid ul Adha 2013. 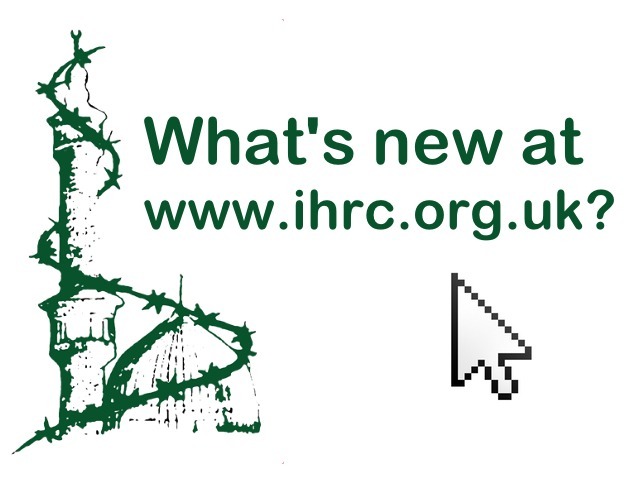 If you would like to donate please call us on +44 20 8904 4222 or email advocacy[AT]ihrc.org or donate on-line here. You can pay for 10 packs at £50, 20 packs at £100 or 100 packs at £500. If you want to donate a different amount please call us. Schedule 7 to the Anti-social Behaviour, Crime and Policing Bill 2013 makes a number of changes to Schedule 7 of the Terrorism Act 2000 (‘the act’). In this submission we argue for one change above all others: repeal. The bill has passed the Committee stage and is scheduled for the Report Stage on Monday 14 October 2013. Therefore an amendment to repeal must be tabled by this Friday 11 October. A Message for October 8, my 74 Birthday. It is certainly sobering to be celebrating the start of my 74 year mired down in this prison. It is even more so when there is my life line that must be considered. Nonetheless, I remain my ebullient self and face my fight and my future with optimism. Part of the reason for this is the wonderful mail I receive daily from people all over the U.S. and the world. From Tasmania to Tel Aviv (!?) people write and tell me of the role I play and have played in their lives. It is overwhelming sometimes. Faisal Bodi looks at the latest development a year after Talha Ahsan and others were sent to the US. Arzu Merali reflects on the crisis of politics in Turkey. You can make orders online, over the phone or just come in to visit us. We also have Eid cards such as these which you can give to your friends and family. Mansa Musa was the king of Mali. Located in western Africa, Mali became one of the largest empires during the time of Musa’s rule. Musa helped his empire grow in size and culture by encouraging the arts, literature, and architecture. This is a beautifully written and vividly illustrated story about the traveller Nurallah and his encounter with an Eid Jinn who wouldn’t let anyone celebrate Eid. Find out how Nurallah gets the better of the jonn and how the words of Allah are truly powerful. Recommended for ages 7 and over. This collection of letters and essays captures the spirit of George Jackson, he presents his analysis of armed struggle, class war, fascism, communism and a wide array of topics. A must have for Black Panther enthusiasts. In this founding work in the literature of black protest, Du Bois eloquently affirms that it is beneath the dignity of a human being to beg for those rights that belong inherently to all mankind.